This may very well be one of my favourite books of the year. 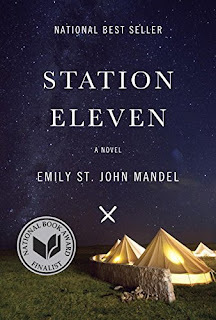 Weeks after finishing Station Eleven, I still find myself thinking about the world that Emily St. John Mandel has created within its pages and of the people who inhabit them. I keep wanting to return to that world where wonder exists in the midst of seemingly insurmountable odds, where existence is so much more than just survival. On a snowy night in Toronto, famed stage and screen actor Arthur Leander suffers a fatal heart attack onstage in the middle of a performance of King Lear. Despite the CPR administered by audience member Jeevan Chaudhary - a former paparazzo, now an EMS responder - Leander dies in front of his young protege, child actor Kirsten Raymonde. That same night, though, the tragedy unfolding in the theatre is overshadowed by a deadly flu that has arrived in the city on a trans-Atlantic flight. Quickly, hospitals are overwhelmed, people begin to die, and the world goes dark. Fifteen years after the Georgian flu has wiped out 99% of the world's population, Kirsten Raymonde is an actor in The Travelling Symphony, a group of musicians and actors who traverse the Great Lakes area performing Shakespeare in the small isolated settlements that dot the region. Station Eleven moves back and forth through the decades, from the post-apocalyptic world of the roving performers, to Arthur Leander's early years and rise to fame, and back to that fateful night in Toronto when Jeevan Chaudhary - cautioned by a call from a friend who is an Emergency Room doctor - barricades himself in his brother's highrise apartment and watches the lights of the city die. The novel unfolds through the eyes of Raymonde, Chaudhary, Leander, as well as Leander's wives and friends. Slowly, the threads from their individual stories, separated by time, geography and circumstance, weave into a single strand. Mandel is a gifted storyteller. She eloquently meters out the growing fear and ominous realization of that first night. She melds the survival instinct and resiliency that has become a critical part of life by Year 15 post-pandemic with a sense of wonder and a basic human need to elevate existence to something higher than food and shelter. Everyday occurrences of the past - like pressing a button that connects you to someone else on the other side of the world or the light that comes on when a refrigerator door is opened - have become things of legend, stories passed among those too young to really remember when these things were reality. There are even rumours of the existence of a Museum of Civilization in an airport terminal somewhere. Through her weaving of timelines and stories within stories, Emily St. John Mandel gradually pieces together seemingly scattered tales into one beautifully interconnected work. Adding this one to my list for 2016. Thanks! Smart moves, Eugene and Karen! I hope you enjoy it as much as I did. It sounds fascinating so I may have to read this now. I've only started reading again after quite a hiatus and am enjoying it. I just finished The Alchemist and am about a third of the way through The Martian which I'm also enjoying. Thanks for the review! Welcome back to reading, Dale! I am making more time to do so as well. No more just reading during the two seconds between when I climb into bed and when I fall asleep! The Martian is on my list!